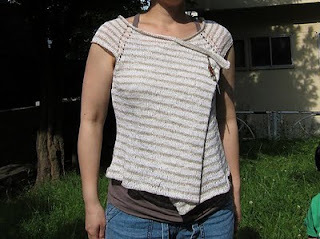 Knitnscribble recently found expert knitting designer, Naganasu from Sapporo, Hokkaido, Japan, who knits beautifully and predominantly from the top-down with raglan sleeves. 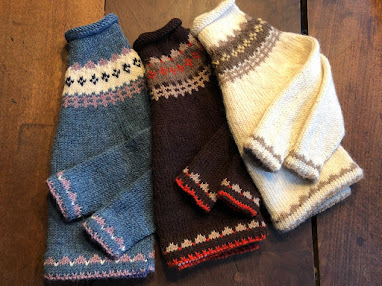 Her top-down knitting patterns are gorgeous, written in English and Japanese, available in Naganasu's native Japanese in her Ravelry store. 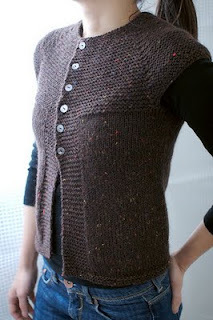 You'll find these lovely top-down patterns in English on Ravelry. 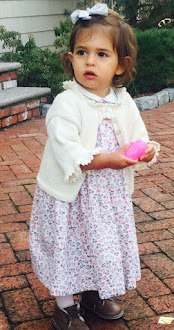 This easy, top down gilet, sweater or vest can be worn many different ways as you can see here. 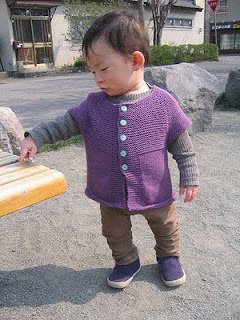 This top down toddler garter stitch sweater vest is among the free patterns offered by Naganasu and can be enlarged upon for an adult top down sweater vest seen below, knitted by azzuknits. Very versatile, can be worn all year long and the top down vest knit from the yoke is a free pattern. Naganasu's photos used with permission. Find all of her patterns here.